A filming request has been made for 1083 Dundas st w on October 10. Parking spaces will be used on Dundas Street West between Shaw and Ossington. See below for filming details. Filming an interviewer with an “Ed the sock” type character walking around talking to real people in and around the park. All public access will be maintained. 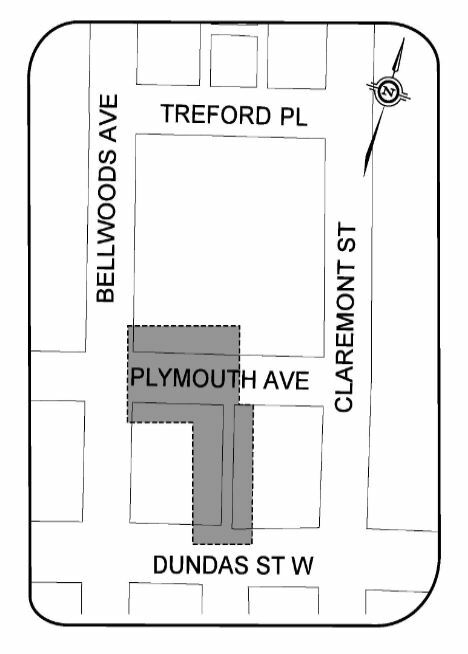 The City of Toronto is planning to reconstruct Plymouth Avenue from 39m west of Claremont Street to Bellwoods Avenue as well as the laneway located 38m west of Claremont Street from Dundas Street West to Plymouth Avenue. This work is part of the Council-approved 2015 Capital Works Program to renew aging city roads and laneways for current and future needs. Work crews will mark the locations of underground utilities, such as gas, water and cable so that the construction work does not interfere with these utilities. Affected properties will receive a Construction Notice approximately two weeks before work begins with more information about the work. Work in the boulevard in front of homes and commercial properties is expected. This work includes removing and replacing driveways, municipal sidewalks and grassed boulevards, where necessary. Property owners should remove items located within City property limits (boulevard), such as landscaping and or decorative objects before work starts. If you have a sprinkler system within the boulevard, please contact the Field Ambassador listed on page 2.
access during the construction period. Download the construction notice here. Be sure to attend the public meetings if you have any concerns. Full details below. The following items will be before the Committee of Adjustment on Thursday, September 24, 2015 in Committee Room 1 of Toronto City Hall, 100 Queen Street West. The following items will be before the Committee of Adjustment on Wednesday, October 7, 2015 in Committee Room 2 of Toronto City Hall, 100 Queen Street West. The 3rd Toronto Scout group has been serving the Trinity Bellwoods and Parkdale community since 1909 by providing programming for girls and boys from the age of 5 through to 26. The goal of scouting is to create well rounded individuals with diverse interests that can contribute to society. This is achieved through programs that challenge youth to discover and engage in their local community and explore the great Canadian outdoors whilst having lots of fun and making new friends. By grouping youth into small groups to solve challenges they gain teamwork skills. Youth are also responsible for training younger youth, providing important leadership skills. The well established scouting infrastructure allows our group to introduce youth to the great Canadian outdoors inexpensively through camping and diverse outdoor adventures. For more information see the 3rd Toronto Scout group website or contact us at 3rdtoronto@gmail.com.